Flagship CX-9 turns heads, stirs hearts. Three-row, midsize SUVs are popular models, taking over largely where minivans left off. The Mazda CX-9 is one of several models in the segment and is now in its second generation. 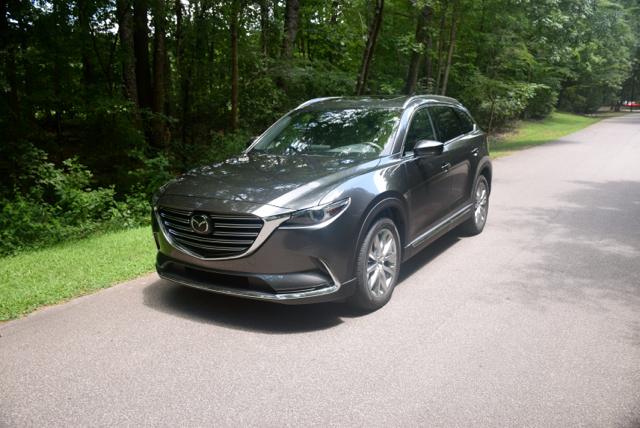 In many ways the CX-9 is the flagship of the Mazda fleet, offering more passenger room, utility, and size than any other model from this zoom-zoom brand. Mazda may be best known for its cars and zoom-zoom, but this small automaker based in Hiroshima, Japan, is attracting quite a following for its SUVs. The manufacturer offers three utility vehicles, including the subcompact CX-3 and the compact CX-5. In the medium segment is a three-row CX-9, introduced in 2007 and now in its second generation. It competes in a class with such models as the Ford Explorer, GMC Acadia, Nissan Pathfinder, Dodge Durango, Honda Pilot, Chevrolet Traverse, Toyota Highlander, and the Buick Enclave. Like its competitors, front-wheel drive is the standard and all-wheel drive is available. The 2016 Mazda CX-9 is an all-new model, replacing the first-generation CX-9 sold from 2007 to 2015. Like the earlier model, this one offers standard front-wheel drive and available all-wheel drive. The most important change besides a “clean sheet” redesign for 2016 can be found in what’s under the hood. In an effort to save weight and improve fuel economy, a 2.5-liter turbocharged four-cylinder engine is the only engine offered. The 2016 Mazda CX-9 is available in four trim levels: Sport ($31,520), Touring ($35,970), Grand Touring ($40,170), and Signature ($44,015). Only the Signature edition offers standard all-wheel drive, otherwise AWD is a $1,800 upgrade across the model line. Depending on trim level, the CX-9 offers various packages and accessories. A heated power driver’s seat and heated side mirror package is available with the Sport edition. A Touring premium package is offered with the Touring edition. Paint options are available with the two top models. Who said an SUV has to look boring? Not Mazda. The countenance of this vehicle matches its other models and that’s not an easy feat to pull off. From bumper to bumper this SUV is sleek with distinct curves, body sculpting, and a flowing beltline to consider. The front fascia is marked by a large gaping upper grille and a sporty lower grille opening. Sleek headlamp assemblies, bumper embrasures, and hood sculpting help amplify this model’s visage. Powerful shoulders are present as are sculpted wheel wells — both contribute to the overall sportiness of the design. From the side, the upper portion of the hood pushes beyond the grille line, giving this model the appearance of an overbite. The flowing beltline and swept back roofline contribute to the SUV’s overall sporty persona. At the rear, the CX-9 is marked by sleek wrap around combination lamps connected by spear-like metal trim. Additional chrome embellishments, reflectors, and a chrome dual exhaust are also present. Mazda provides three rows of seating in the CX-9 by offering bucket seats up front, a 60-40 split-folding seat in the second row, and a 50-50 bench seat in the third row. That third row is tight and best left for the teens or younger folk in your group. Access to the third row comes from moving the second-row seat forward and tilting same — yes there is sufficient room to squeeze on through. Seating support is quite good all around, especially in the first two rows. I expected the first row seats to provide the necessary back and hip support, but the second row was a big surprise, especially for the outboard positions. Both seating positions are plush and bolstered, the middle seat is firmer and leg room is limited by the drivetrain hump. 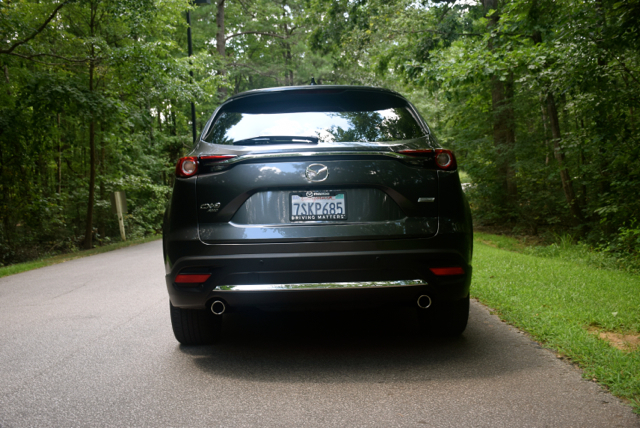 Throughout my week with the 2016 CX-9, I was impressed by the level of quality apparent throughout the interior. The Signature edition is, of course, the show model in the segment. It comes dressed in leather across the seats, on the dashboard, as well as on the door inlays. Genuine rosewood touches surround the lower center console and extend to the front doors. Soft touch materials and brightwork trim were found elsewhere, but the look overall is elegant and upscale. I’ve seen similarly appointed interiors elsewhere, but usually on luxury models. The nearest trim equivalent in this class would probably be the Buick Enclave with the Premium Group package or a GMC Acadia in Denali trim. Just as the CX-9 has a flowing exterior theme, that design carries over to the SUV’s interior. Three large circular displays dominate the instrument panel with the tachometer on the left, a speedometer in the middle, and a digital driver’s information center on the right. Typically, digital displays are located directly between the tach and speedometer, but Mazda chose to place them together, perhaps for greater driving awareness. The center stack reminds me of Audi with its tablet-like display sitting on top of the dashboard. However, unlike most Audi models, the Mazda display is fixed in place — it neither rises or falls. Beneath the display is a pair of climate control vents, seat heating switches, as well as buttons and knobs to operate the climate control system. At the very base of the stack is a canted open storage compartment — ideal for storing your smartphone. Between the seats are the transmission shifter and the drive shift mode switch. A larger control knob, similar to what is offered by BMW is immediately behind the transmission shifter and works as a mouse to control the screen. To the right is a volume knob. To the left is the electronic parking brake. Immediately between the seats is a covered armrest, serving in a dual capacity as a storage compartment containing a pair of USB ports, an audio port, and an SD slot. Two cup holders sit in front of the armrest; the rear facing section includes climate control buttons and vents. 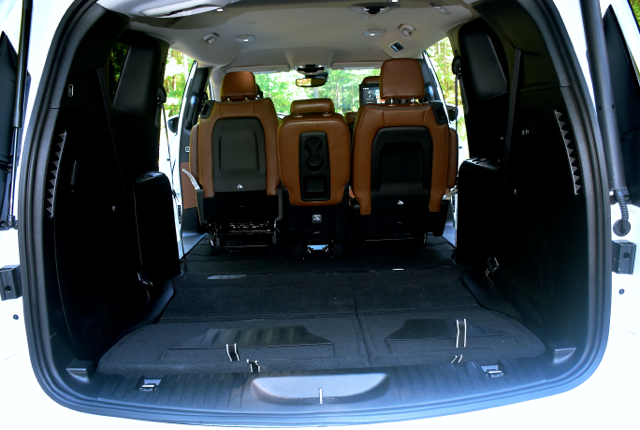 All four doors come with bottle holders and storage compartments. Fold down the second-row seat middle armrest and you’ll find two cup holders, an open storage area and a pair of USB ports. That storage area is large enough for you to line a pair of smartphones side by side while recharging. The rear seat includes wall-embedded drink holders and open storage on both sides of the vehicle. The CX-9 has a feature I haven’t seen yet — dual seat-back storage pockets for each of the front seats. One is deeper than the other, but together they offer interesting storage possibilities. I like to think families would find them useful for holding coloring books, folders, and the like. Behind the third-row seat, you’ll find hooks and tie downs. You’ll also find the temporary spare tire sitting on the floor and a pair of concealed storage compartments on either side. A 12-volt, 120-watt outlet is also present. 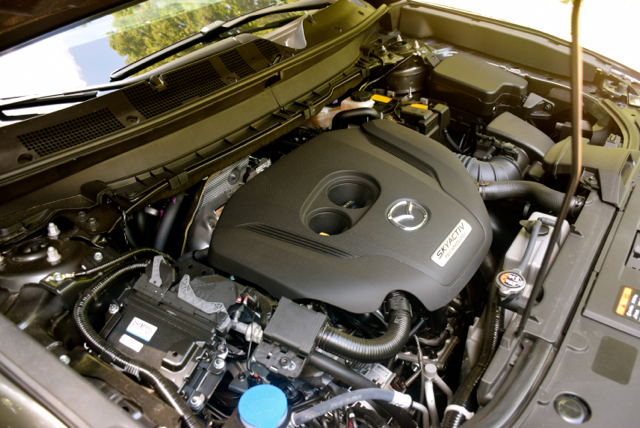 Mazda took a risk this year by replacing a naturally aspirated V-6 engine with a turbocharged four-cylinder. The new engine makes 227 horsepower (250 with premium grade gasoline) compared with the 273 horsepower in the previous model. When it comes to torque, the new engine has the edge, making 310 foot-pounds versus the previous 270 foot-pounds. Helping matters for the new model is a 250-pound drop in overall weight despite the addition of 53 pounds of sound-deadening materials. This engine is paired with a 6-speed automatic transmission. The EPA rates the 2016 CX-9 at 22 mpg in the city and 28 mpg on the highway. Take this Mazda on the road and you’ll discover the performance side within thanks to its DNA. The CX-9 moves away from a dead stop at a normal clip and travels down the road with authority as soon as the turbo spools up. More than once I forget a boosted four banger was under the hood — it behaves much like the engine it replaced. The difference maker for this SUV is the sport mode — what ramps up the driving characteristics. Once engaged, the engine throttle controls and transmission shift points adjust for sportier engagement. 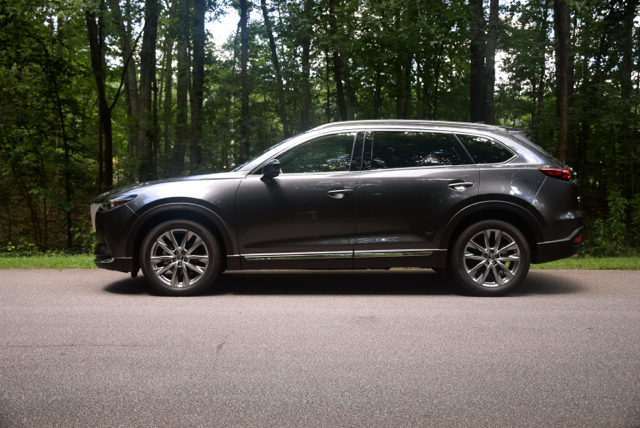 Tackling the twisties may be more to your liking in a rear-wheel drive sports car, coupe or sedan, but the 2016 CX-9 delivers surprising enjoyment there too. Thanks to the I-Activ all-wheel drive system, this model offers excellent control and balance. Much credit should be given to the torque sent to the rear wheels as needed in an effort to deliver a more composed drive. Mazda Connect is the name of the Mazda infotainment system. It comes with either a 7- or 9-inch color display and features voice command, short messaging service with audio delivery and replay, emergency notification, and an optional navigation system. I mentioned the interior layout earlier, but it bears reiterating the Mazda system rivals that of some luxury makes. It also works as planned and if you want to avoid the dial, then voice commands will do. I was also glad to discover that a head’s up display (also known as active driver display) was included with the test vehicle. Unlike the system found in other Mazda models, this one is projected right onto the windshield. It shows such features as your speed, the local speed limit, cruise control, and navigation. Yes, I am a head’s up fan — technology that helps you keep your eyes on the road and your hands on the steering wheel. The CX-9 also offers a 12-speaker Bose audio system. Bose does an excellent job of distributing clear and crisp sound throughout the cabin and, yes, it as close to any system found in luxury models. Crash testing by the Insurance Institute for Highway Safety (IIHS) is pending for the 2016 CX-9. We’re expecting improved numbers over the outgoing model, which scored poor or marginal in three of the five tests conducted. All models are outfitted with a suite of airbags, roll stability control, traction control, and a rearview monitor. A blind-spot monitoring system and rear cross-traffic alert are included in the Touring and Grand Touring editions. The Grand Touring edition brings in an optional distance recognition support system, high-beam control, lane keep assist, radar cruise control, rear backup sensor, and brake support. 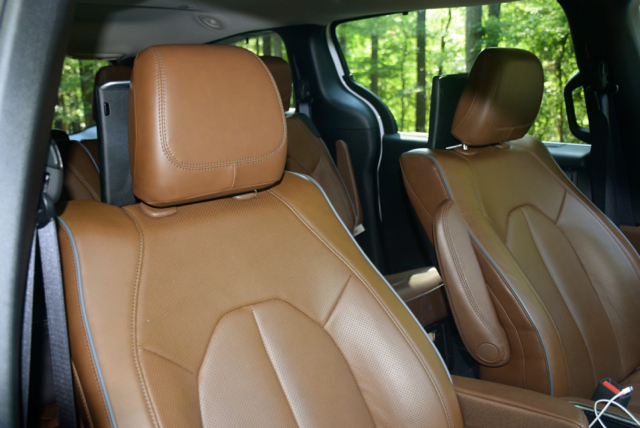 If leather seats are your thing, you’ll find them in Touring trim. You’ll also get heated front seats as well as an advanced blind-spot monitoring system with rear cross-traffic alert. That makes for a generous package starting around $36,000. Certain competing models offer the safety features further up the trim level chain or as part of a package upgrade. Seriously consider all-wheel drive even if you’re satisfied with front-wheel drive only. The $1,800 upgrade is worth it — the driving dynamics improve and if you ever need to tow something, AWD is certainly helpful when the wheels begin to slip. As for the Signature edition, you might consider one if you have a luxury model in mind, but prefer to stick with Mazda and all its zoom-zoom fun. Kudos to Mazda for making a complete package in its second go around with the CX-9. The look, feel, and drive of this SUV puts it a cut above most mainstream models, even in the base edition. Mazda may not have the sales numbers of a Toyota, GM, or Volkswagen, but from model to model they consistently exceed industry and consumer expectations. The Chrysler Town & Country is gone, replaced by the all-new Pacifica minivan. The Chrysler minivan is back. Not that it ever left, but the previous models were overshadowed by the Toyota Sienna and Honda Odyssey. Not anymore. 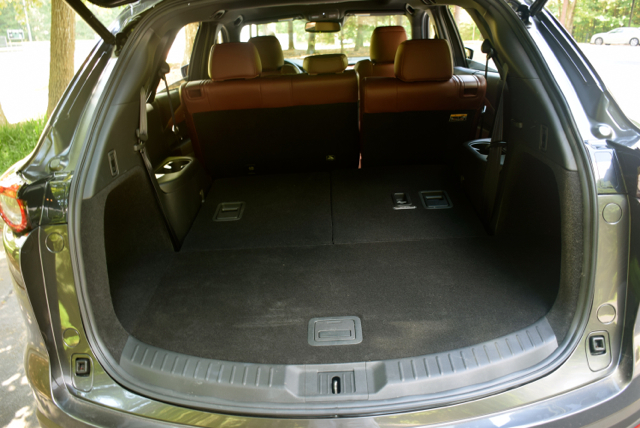 The all-new 2017 Chrysler Pacifica is as good as any model out there and with its stow ’n go seating, it provides a feature that its competitors simply do not match. The 2017 Chrysler Pacifica successor to the Chrysler Town & Country a minivan produced from 1990 to 2016. The Town & Country name was previously used on various coupe, convertible, sedan, and wagon models dating to the early 1940s. Chrysler resurrected the Pacifica name, last used for a crossover utility vehicle (or tall wagon) built from 2004 to 2008. The two models are unrelated. The 2017 Pacifica is a front-wheel drive model with room for seven or eight, depending on your seating choice. The 2017 Chrysler Pacifica is an all-new model. This one represents the first year of the first-generation model and was introduced in spring 2016 for the 2017 model year. The 2017 Chrysler Pacifica is available in five trim levels: LX ($28,595), Touring ($30,495), Touring L ($34,495), Touring L Plus ($37,895), and Limited ($42,495). The base model is priced $1,400 lower than the 2016 Town & Country. 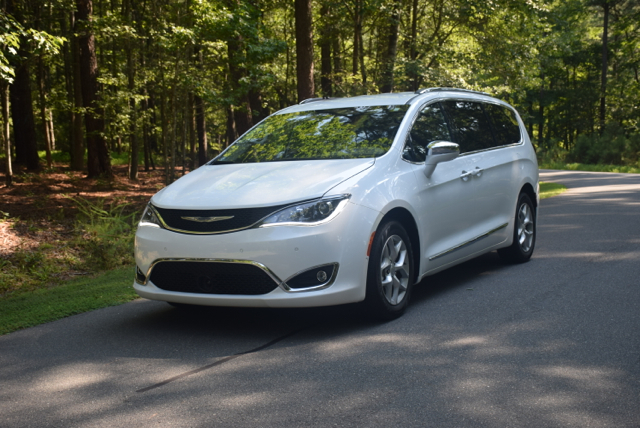 Chrysler provided a 2017 Pacifica Limited for the Auto Trends test drive. No Monroney (window sticker) was available, but two packages were included. A UConnect Theater and Sound Group ($2,795) brings in a 115-volt auxiliary power outlet, a 220-amp alternator, a 760-watt amplifier — part of a 20-speaker Harman Kardon Audio Group — a Blu-Ray and DVD entertainment system, a pair of seat-back-mounted high-definition video touch screens, and a pair of wireless headphones. The second package was an Advanced Safetytec Group ($1,995) composed of a 360-degree surround view camera system, adaptive cruise control, advanced brake assist, automatic high beam control, forward-collision warning plus, lane departure assist plus, and parking assist. Special tire and wheel upgrades, a trailer tow group, and front and rear splash guards are also available. Fully loaded, a 2017 Pacifica Limited pushes close to $50,000. However, bonus cash offers will typically reduce your final price. One glance at Pacifica’s front fascia and you’ll find a familiar expression, one advanced by the current-generation Chrysler 200 midsize sedan. This model has a narrow upper grille and a more pronounced lower grille with headlamps and available fog lamps hemming in both respectively. Much of the rest of the van offers a familiar layout, including its dual sliding doors. However, there are also some key differences in this clean sheet design, including a sloping roof line, distinct character lines, and lower body trim. From the rear, oversized combination lamps, a built-in spoiler, and reflectors are present. Standard 17-inch aluminum wheels can be upgraded to 18-inch aluminum polished wheels. 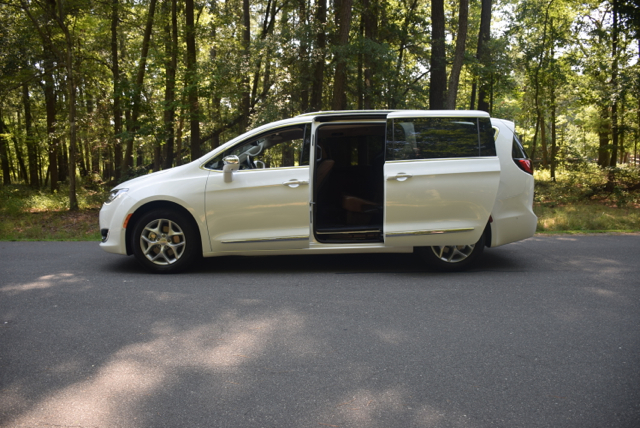 And for the first time ever, this minivan now offers available 20-inch wheels, part of a package bringing in eight-passenger seating in the Limited edition only. As the photos show, my test model was so equipped. All models also come with folding, heated side mirrors. Further, a roof rack and rails are also available or are standard beyond the base trim level. Chrysler lays out Pacifica’s seating configuration in 2-3-2 or 2-3-3 fashion. The first choice offers captain’s chairs in the middle row. The second choice brings in a split-folding bench seat. Carefully weigh the importance of acquiring an extra seating spot here at the expense of losing the very comfortable and versatile captain’s chairs. Nevertheless, the test model came with the 40-20-40 middle bench seat and it isn’t a bad arrangement. 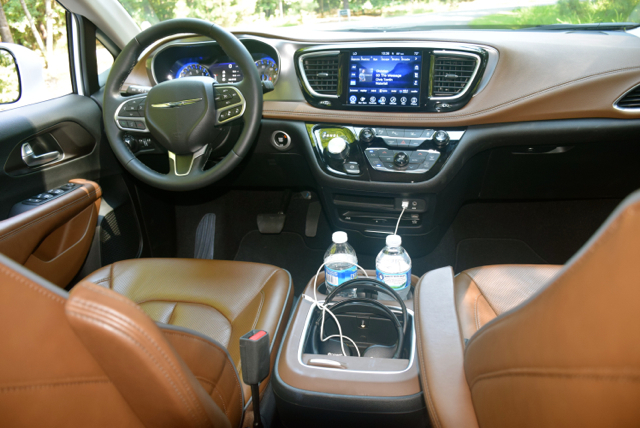 Chrysler pushes the center console far enough forward to provide ample leg room for the middle seated person, even with the rear facing pullout drawer with two cup holders. From front to back and from side to side, this “mini” van seems quite large. The greenhouse gives this model a bright and airy impression. The Limited edition brings in window screens for the sliding door, providing a measure of privacy. 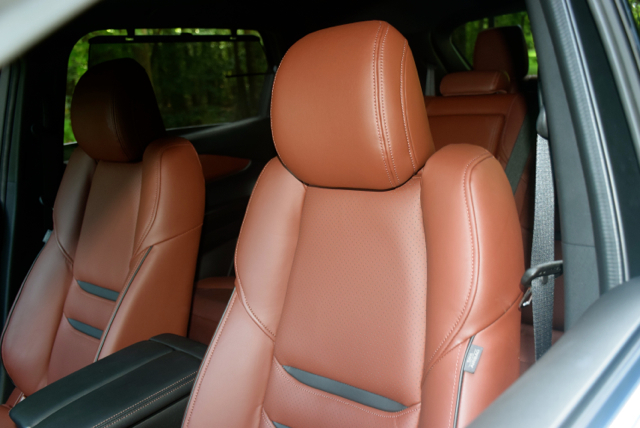 This model has leather-appointed seating and leather door inlays, with soft-touch materials and brightwork trim across the dashboard, on the door frames, and surrounding the center console. The instrument panel features a pair of analog displays —speedometer and tachometer, along with a multi-color digital driver’s center. The face of the steering wheel offers switches for controlling the center unit. Head to the center stack and you’ll find an 8-inch color display for the UConnect telematics system. I’ve praised this system in the past and continue to do so — it is intuitive, easy to operate, and the directions are spot on. Beneath that is the transmission shifter and an electronic parking brake along with various driver controls, and the climate control system. Head further down and you’ll find an open storage slot for holding your smartphone, a USB port, and an audio port. Moreover, a CD player and a large pullout storage drawer large enough to hold your iPad are also present. At the base of the stack is an open storage area along with a 12-volt outlet and a USB port. The storage area is large enough to hold a small purse. Another open storage compartment is forward the center storage console, along with two cup holders, and a roll top storage area. This console does not do double duty as an armrest — Chrysler provides a pair of fold-down armrests for both front seats. Each of the front doors comes with one drink holder and multiple storage compartments. The rear sliding doors each have drink holders, but no storage. The center seat position, when flipped down, provides two additional cup holders. The third-row seat has three drink holders embedded in the wall — one on the driver’s side, two on the passenger side. Take note of the 115-volt outlet as you enter the third row as well as the USB port and open storage compartment adjacent to the drink holders on the passenger side. When the third-row seats are in place, you’ll find a deep storage compartment behind same. You’ll also come across a temporary spare tire in a side wall compartment, a 12-volt outlet, and tie downs. This model’s stow ’n go seating system may be the difference maker for many consumers. It is an easy way to hide the third- or second-row seats, even both. In doing so, you get a ridiculous amount of storage room. Importantly, the folding seats are thicker and more supportive than ever, despite needing to hide away underneath the floor. When not in use, the same storage compartments can be utilized to hold other items — that’s a double win for consumers. The 2017 Chrysler offers one powerplant combination. A 3.6-liter, V-6 engine is paired with a 9-speed automatic transmission. This engine makes 287 horsepower at 6,400 rpm and 262 foot-pounds of torque at 4,000 rpm. It has a 1,675-pound payload and provides 3,600 pounds towing capacity when properly equipped. The EPA rates this model at 18 mpg in the city and 28 mpg on the highway for a combined 22 mpg. The V-6 engine is aptly suited for this vehicle. 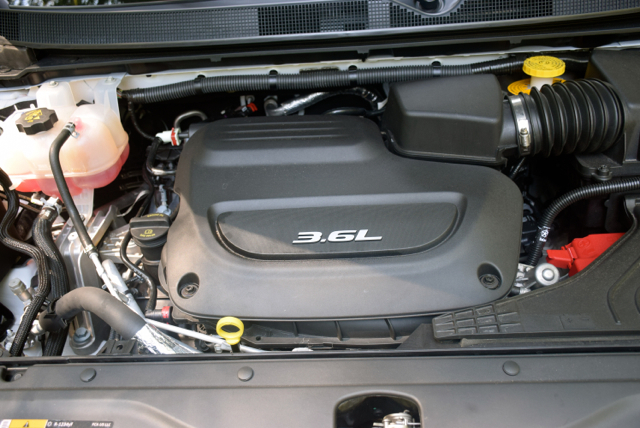 It is the same engine FCA uses to power such models as the Ram 1500, Jeep Grand Cherokee, and the Dodge Charger. No boosting is necessary — just step on the gas pedal and the engine roars to life. I’m sure some of the rumbling emanating from the exhaust system is artificial, but at least the performance is there to back it up as the minivan climbs to highway speed quickly and without hesitation. How would the Pacifica perform with a full payload and pushing the minivan to its 3,600-pound towing capacity? I never found out as four was the maximum number of people carried at any time and I had nothing to tow. But at least the capacity is there and it gives customers something to consider that isn’t a crossover (Dodge Durango) or a pickup truck (Ram 1500). The 2017 Pacifica rides quietly and road noise is minimal. On the noise, vibration, and harshness (NVH) scale, this vehicle gets high marks thanks in part to its standard active noise cancellation technology. It also scores well in the handling, steering, and braking dominions. The 2017 Pacifica provides a feature never offered in the Chrysler Town & Country or the Dodge Grand Caravan, but offered by Honda in the Odyssey: an in-cabin vacuum. For its unit, FCA turned to Emerson, maker of the RIDGID vacuum to design one for the Pacifica. Unfortunately, the vacuum was not included in the test model, but for vehicles outfitted with one, it provides ease of access to the second row area where most spills and messes are found. The hose can reach the entire interior of the Pacifica, then retract into its storage space. The manufacturer claims best-in-class suction and that’s good news for families. 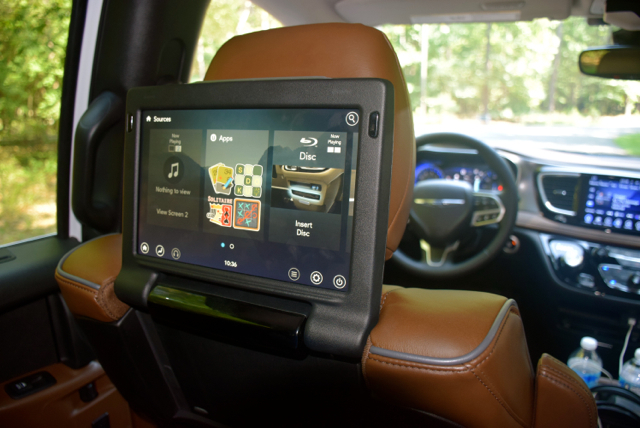 Other technologies are mentioned elsewhere and include the Chrysler UConnect system. UConnect also offers Apple CarPlay and Siri Eyes Free integration. If you don’t have an iPhone, now worries: the system is Android Auto compatible too. Chrysler says the 2017 Pacifica has more than 100 safety and security features. I wasn’t about to count them all, but I can tell you that this minivan offers several features that portend autonomous driving. See the “trim levels and price” section above for an available safety package. All models are equipped with a suite of airbags, including driver and front passenger knee airbags. Brake assist, traction and stability control, electronic rollover mitigation, hill start assist, and trailer sway control are among the standard features. The 2017 Pacifica has not been crash tested by the Insurance Institute for Highway Safety (IIHS) as of publication. 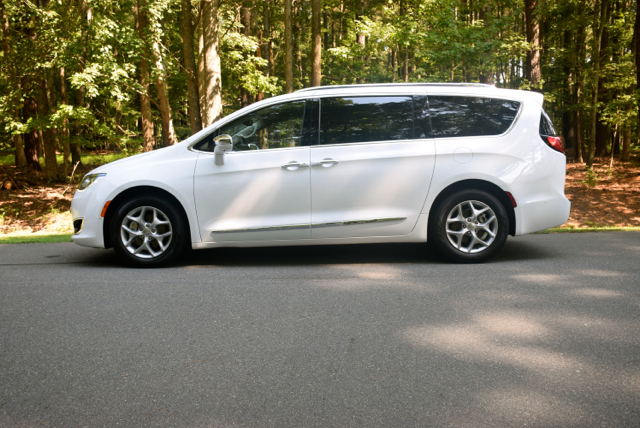 Chrysler expects the toughened minivan will receive a top score in the institute’s small front overlap test where the previous model received a poor grade. Credit must be given to the broader use of high-strength steel and a stronger floor. 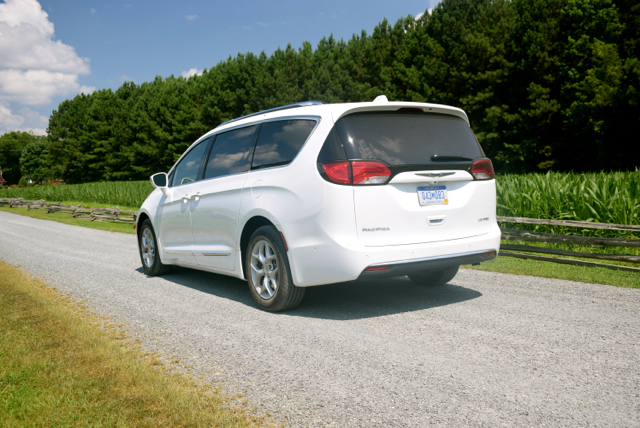 In the process, the Pacifica saved upwards of 250 pounds compared to the Town & Country. Auto Trends typically recommends buyers consider the middle group of trims when looking at any new vehicle. Manufacturers expect that too, so you’ll probably find dealer lots filled with all three “touring” editions. From there, carefully examine what’s important to you. For many minivan owners, the vehicle is like a home away from home, useful for carting your students to school, games, and to other activities. Still, to get a loaded model you’re talking about a $40,000 price tag, but that’s not uncommon in this segment. The 2017 Pacifica is an improvement over the previous Chrysler Town & Country in every way. Honda and Toyota offer stiff competition and the Kia Sedona and Nissan Quest might also be considered. It should be noted that Fiat Chrysler will continue to make the Dodge Grand Caravan for a few more years, an older model and the longtime twin to the now-retired Town & Country. Minivans offer more versatility than comparable crossovers and for this reason they’re worth considering — but why not consider the new model on the block?